Born in a family of Vietnamese classical opera (Tuong), Meritorious Artist La Thanh Hung inherits all professional skills as well as passion for this kind of arts. After years of performing and contribution to promote it, he voices the concern that there may not be many enthusiasts for Tuong in the future generation of Vietnam. La Thanh Hung was born in Phu Vang District of the central province of Thua Thien Hue, and spent most of his childhood in Huu Vu – an area in the Inner Court of the Purple Forbidden City for military mandarins to work. Young La Thanh Hung used to learn classical opera skills and techniques from his own father, Artist La Chau, and other famous artists of Tuong who specialized in performing for the King like Viem Bo. That formed a strong foundation as well as passionate love for the young boy to follow his father’s footstep later. Meritorious Artist La Thanh Hung is now worked as an arts director in the Theater of Hue Traditional and Royal Art. He has directed hundreds of classic and historical Tuong plays to be performed in the country and the world. He has also supported many artists on their way to win renowned national awards. 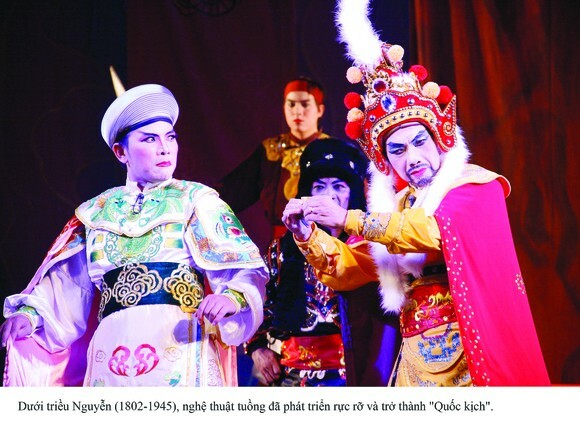 Recently, in the 2018 Vietnam National Traditional Arts Festival held in the central province of Quang Ngai, the Tuong opera ‘Road to the Golden Week 1945’ under his direction has won the silver medal, while his students have also won gold medals themselves being players in that opera. Artist Hung shared that each arts festival is a wonderful chance for artists, especially the young, to practise and exchange valuable techniques as well as knowledge with one another. Winning or not, they all accumulate precious experience and nurture their passion through these festivals. Understanding the current situation of traditional arts in Vietnam, Artist Hung truly appreciates every time he is able to direct a play, regardless of salary. Tuong plays, according to him, focus on symbolizing actions rather than real ones. For instance, when imitating a man riding a horse, artists only need to hold a horsewhip and swing it around. Similarly, holding a glass of wine means players are attending a party. 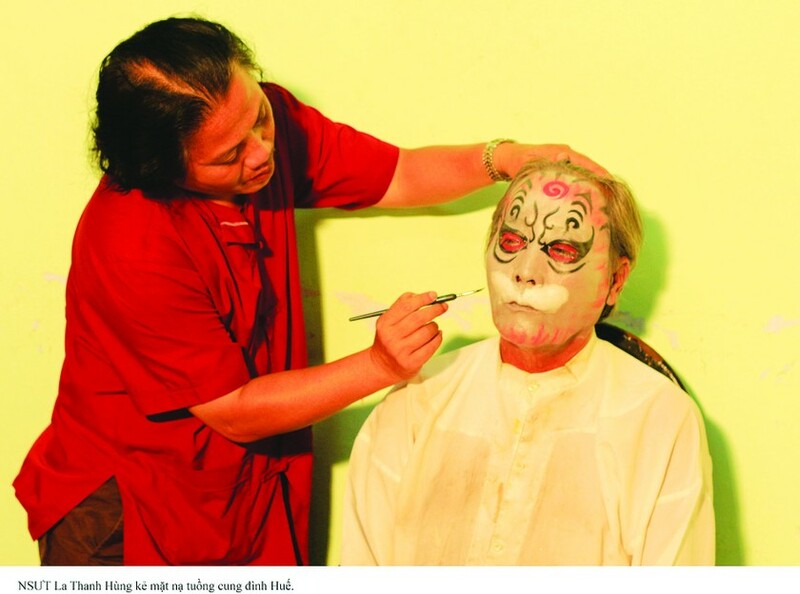 One of the most significant features of Tuong play is its meaningful make-up masks. The various colors and strokes on each make-up symbolize one specific characteristic, be that a king, a military hero, an honest man, or a flattering person. As a rule, black color means hot-tempered characters, white an ungrateful character, green a disloyal character, and red a courageous character. Many have considered Tuong masks as a masterpiece and an indispensable prop in a play. No matter how essential it is, however, all Tuong artists need to apply make-ups themselves based on their own experience and knowledge. To be a Tuong artist, people need a very strong and deep voice to properly express all kinds of feeling. They also have to practise different dancing skills while singing, or to control their facial muscles suitable for the requirements of their role. Tuong art is said to have existed in Vietnam from the Ly – Tran Dynasty, yet its royal form was officially introduced to the enthusiastic Nguyen Phuc Nguyen King in 1627 by Dao Duy Tu. The art reached its heyday in the years from 1802 – 1945. Particularly, during the reign of Tu Duc and Thanh Thai, Tuong art became an academic art, regarding both its script and performing skills, making it extremely popular among the upper class as well as normal citizens. Through up and down, Tuong art nowadays is still loved by many Vietnamese people. Its advantage lies in its script about historical events, and thus being able to maintain traditional values of this art. Sadly, the young in Vietnam are not very enthusiastic about Tuong plays, forcing a large number of Tuong artists to change their job to earn their living. Another worrying point is that while the professional Tuong artists grow older day by day, they cannot find students to hand down their valuable experience and knowledge since not many young people love to follow this step. “In order to preserve and promote Tuong art in the community, it is necessary that art researchers, experts of the field and Tuong artists cooperate to equip the next artist generation with sufficient skills and expertise while applying different methods to introduce this art form to children at school as well as to the general public via suitable media”, said Meritorious Artist La Thanh Hung.